Edna Ellen Douglas, age 97 of Grand Haven, passed away on Thursday, September 13, 2018 at Riverside Nursing Centre. She was born on February 25, 1921 to the late Ellsworth R. and Edith B. (Wysong) Butz in Union Township, Indiana. After high school, Edna went to Nursing School and became a Registered Nurse. She married Dale Douglas on May 22, 1943 in Davenport, Iowa and he preceded her in death in 1994 after 51 years of marriage. 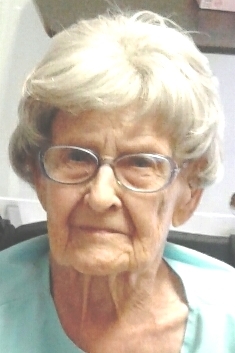 Edna was a member of Fellowship Bible Church, where she was active for many years. She will be lovingly remembered and missed by her daughters, Roberta (Terry) House of Fruitport and Jane Douglas of Grand Haven; son, Ronald (Annie) Douglas of Elkhart, IN; and 2 grandsons, Greg and Jeff Douglas. Edna was preceded in death by a brother, Robert Butz. A Celebration of Edna’s Life will take place on Saturday, September 22, 2018 at 2:00 p.m. at Fellowship Bible Church with Pastor Kelvin Miller officiating. Interment was held at Rice Cemetery in Elkhart, IN. Memorial Contributions may be given to Fellowship Bible Church.